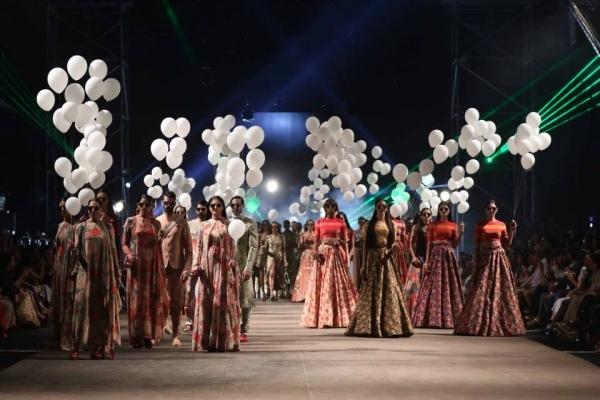 Sabyasachi kickstarted Lakmé Fashion Week with a collection dedicated to the era of love, peace and music. The seventies, as we know it, never looked better! With plenty of flirtatious silhouettes, pretty florals, liberal volumes and heavy sequins, Sabyasachi breathed life back into the disco glam. He reinstated the power of black and gold with pleated pants, gowns and sarees, and introduced a nouveau look with saree-pants. A fair play of volume was infused in bell-bottoms and floral dresses with silhouettes as fluid as silk, throughout. Attention to detail with slick hair, minimal make-up, grandma’s sunglasses and cinched waists added perfection. The collection effortlessly transitioned from classic and earthy colours to blooming floral and blinding bling, with animal prints and patterns adding variety. Floral pant-suits and sherwanis for men kept up with the romantic spirit of the collection and proved Sabyasachi’s ability to imbue power in things that are old and overlooked.